For all that Halo: Combat Evolved is cast as the defining release on the original Xbox (and rightly so) there was another title that, for some, was a greater embodiment of the hardware. 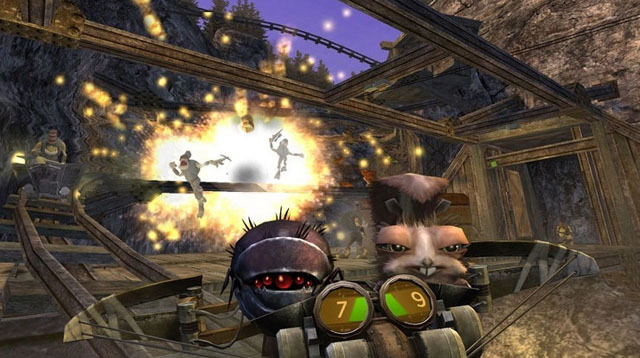 Oddworld: Stranger’s Wrath was a unique melding of genres and while it might have suffered from poor sales, it has become a cult favourite with those who were brave enough to pick up a copy. 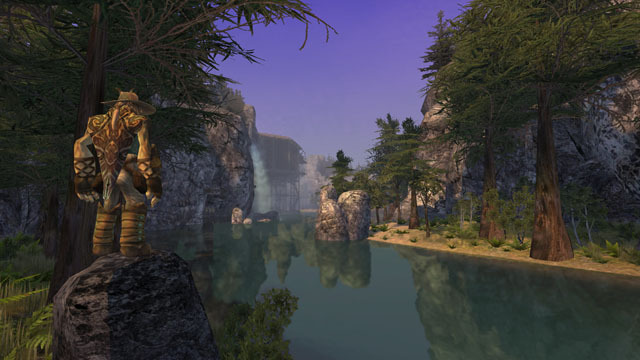 Now that the age of the HD remake is well and truly upon us, it seems only fitting that it should be given another chance, a view shared by Just Add Water as they release Stranger’s Wrath HD for the PlayStation Network. A mixture of third person exploration and first person shooting, Stranger’s Wrath HD tells the story of The Stranger, a shadowy, gravel-voiced character that prefers to let his actions do the talking. Armed with his trusty and unique crossbow, he roams the plains to collect the bounties on the various bad guys littering this Spaghetti Western inspired world. There’s a reason The Stranger is looking to acquire so much money (or moolah to use the parlance of the game) and the reveal provides a nice twist that it would be remiss of this reviewer to spoil for those who haven’t already played the game. There’s a distinct feel to proceedings within Stranger’s Wrath HD, one which encompasses every aspect of the game. The world teems with settlements that are populated by chicken-like creatures called Clakkerz, talking in a southern drawl but inflected with very British phrases such as “piss off!” if you hurt them in any way. Then there’s the way the Stranger regenerates health, performed by beating his chest ala King Kong, offering the games own unique spin on the recharging health mechanic. Even “bagging” bounties is different, as they’re sucked up in a vacuum-style motion. Its a surreal experience but, when a game has the word Odd in the title, it would be disappointing if it didn’t live up to the billing. More importantly this surreal take on things actually makes it charming and the kind of irresistible world you want to invest your time in. The biggest surprise for those who haven’t played before will be how the game handles first person shooting. 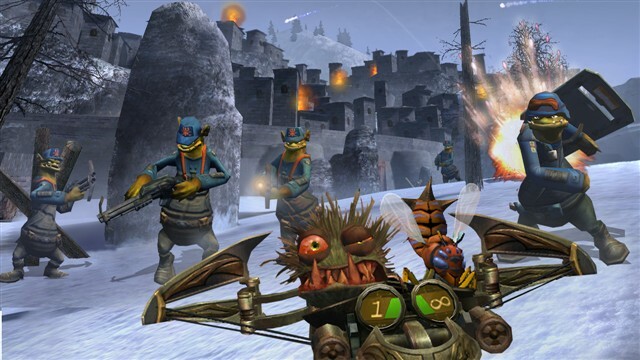 Armed with a crossbow that can fire two types of ammo at the same time, they aren’t conventional bullets but live “critters” that have to be gathered along the way. Needing to harvest ammunition instead of blithely picking it up was always one of the more unique aspects of Stranger’s Wrath, and even to this day it still stands out. From Thudslugs which dole out heavy damage but have a long reload time, Boombats which cause massive explosions, or the adorable Chippunks which cause enemies to throw up, there is a plethora to choose from. The player has an infinite supply of Zappflies so they’re never left without the ability to retaliate against enemies, but the more specialist items are drip fed so as to not overwhelm or indeed overpower the player. In the age where the Call of Duty series reigns supreme, things like the ammo and setting make the approach in Stranger’s Wrath feel even more fresh and entertaining than it did all those years ago. Undoubtedly something of a testament to the original release being ahead of its time. While the narrative gently guides the player along a path to a point, there is flexibility in how they can tackle each subsequent bounty and in an order that the player feels most comfortable. It’s undeniably one of the strengths of Stranger’s Wrath. Sneaking into compounds by laying traps to distract guards is a legitimate tactic which works just as well as proceeding in with all guns blazing, but the flexibility to mix things up is what sets it apart. While it can feel as if it becomes a succession of increasingly difficult boss fights on times, it manages to hold the players interest as they look to resolve the storyline and start to care about how it ends. There is little in the way of modern day concessions for those used to being led by the hand and it’s refreshing that for this update, Just Add Water has refrained from adding anything in the way of quick warps back to towns. Allowing the player to find their own way back, exploring the scenery, is half the experience in Stranger’s Wrath, the journey being as just as important as the final destination. The original was always a gorgeous game to look at and this HD update retains this. There’s some eye-catching scenery in places and the look and style has made the transition to High Definition seamlessly. Finding that the interiors of buildings still have nothing inside is a bit strange (no-pun intended) but it ends up a somewhat reassuring feeling, testament to Just Add Water for preserving the original release in all the right ways, without the need to focus on things that weren’t important. It’s easy to be fatigued by the near ceaseless slew of HD remakes that have cropped up recently, especially when some of them haven’t made the grade. Stranger’s Wrath HD does it properly by taking an already exceptional game, retaining what made it so compelling in the first place and merely tweaking here and there. It’s all the better for it, making this a must-play title for fans of the original release and a fantastic introduction to the Oddworld series for those who might have missed them completely.